ALEPPO, Syria — Below, Najla, a 34-year-old mother of four, talks about rebuilding her life in Syria after losing her husband, home and belongings to war. Najla and her children — Mohammad, 13, Mehdia, 9, Zahra, 7, and Mountaha, 3 — have resettled in an unfinished room in the Karm Al-Nezha neighborhood of east Aleppo. Like so many Syrian mothers across the country, Najla is doing her best to help her children heal and move forward— with UNICEF's help. Five a.m. marks the beginning of my day. 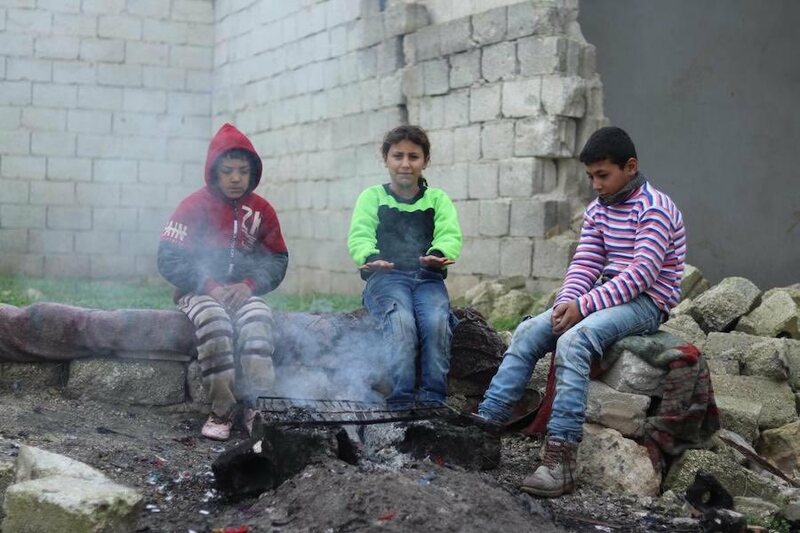 While it’s still dark outside, I get up from the mattress I share with my four children to help Mohammad (far right, below, with Mehdia and a friend) get ready for work and his siblings for school. This has not always been my life. I had never imagined that my children and I would end up in such primitive conditions. Before the war, when winter was a time of warm family gatherings, I lived with my husband and children in a fully furnished home, with a heater, colorful carpets and a fancy serving set. We even had a living room and a guest room — things that seem so far away now. Winter has become a time of suffering as I struggle to protect my children who are always getting sick from the cold. 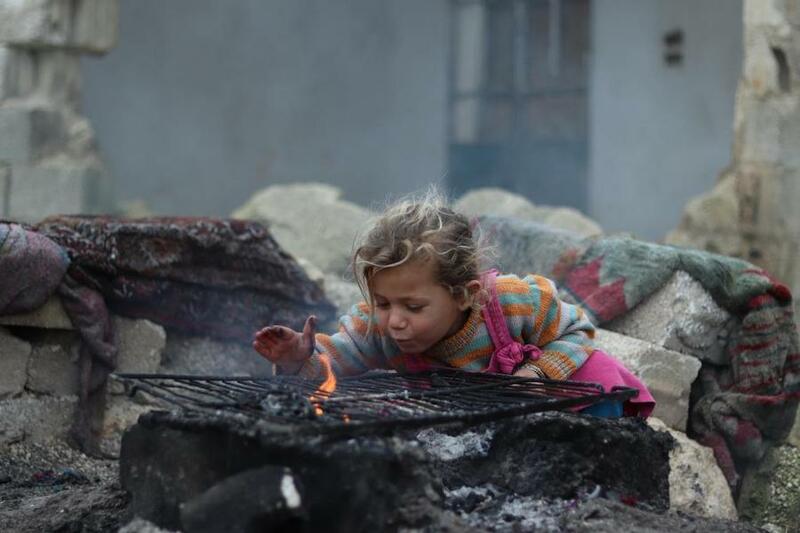 A stove, a few blankets and the fire in front of our home — where Mountaha warms her hands, below — are my only weapons. Our life started changing in 2012, when fighting escalated near our home in the Al-Maadi neighborhood of east Aleppo. We fled more times than I can remember, from one unfinished building or tented camp to another. But that was not the end of our suffering. Four years later, on a chilly day in November, my husband went to check on our house. I begged him not to go; our home was in the conflict zone. Shelling killed my husband that day, and our house was destroyed. I saw no future after that day. But following a respite in violence in 2017, an acquaintance told us of a deserted farm he knew about in a remote part of the city. No longer able to handle living in a collective shelter, we moved into a single room on the farm but I could not sleep the first nights in our “new home.” The area was very lightly populated and made me feel unsafe. 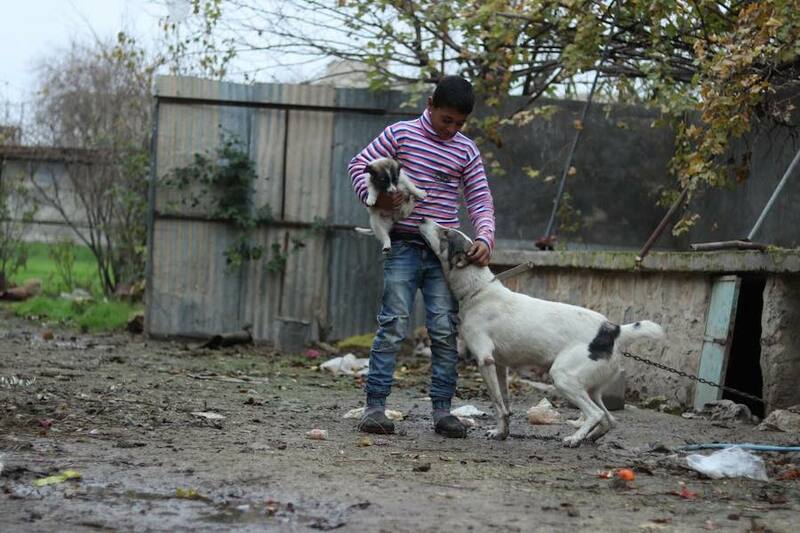 Every little noise made me jump in fear, until a relative gave me a dog (with Mohammad, below) who is now our protector and a valuable member of our family. Having been in and out of school, my children finally re-enrolled last year and are now back to learning. 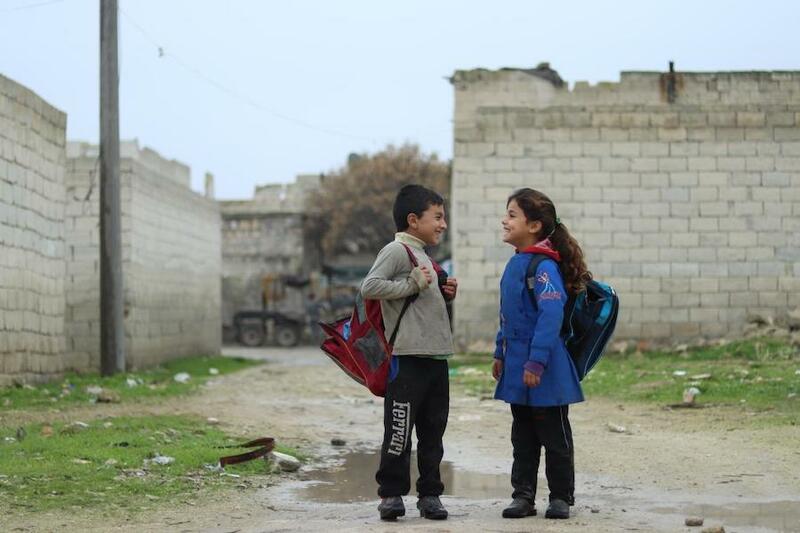 Seven-year-old Zahra (below, right) walks to school with her friend. 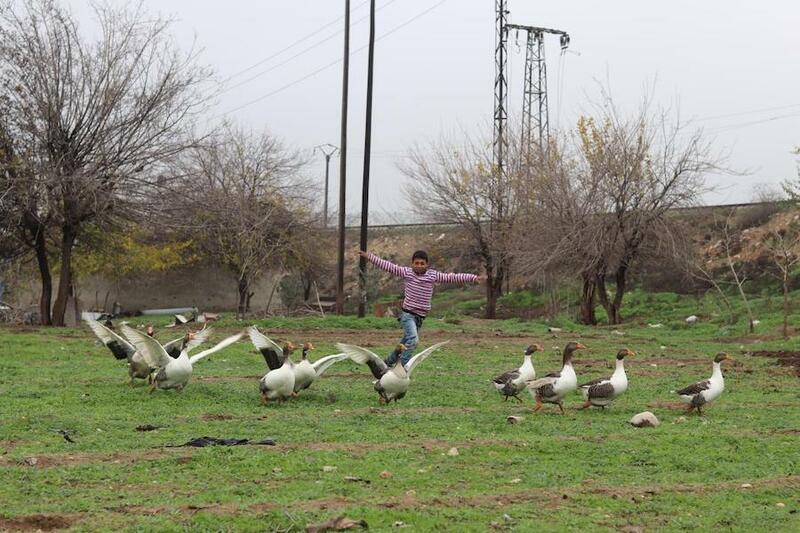 Mohammad works every day, before and after school, on a nearby farm. The $6 he earns per week supplements the monthly stipend we get from a local charity for medicine and food. Life is smiling upon us once again. Like every mother in the world, all I want is to see my children warm, well-fed, healthy and safe. There is nothing I would not do to help them. I am trying to collect enough money to buy a cow and start a small dairy business selling homemade milk and cheese. I have applied for several grants and I really hope it works so that I can stand on my feet again. Najla is among 5,000 people in Syria receiving help from UNICEF-supported social workers who identify families' needs, then refer them to United Nations agencies, NGOs and local organizations that can provide the appropriate care. Najla and her children have received winter clothes, nutritional supplements, food rations, carpets, school bags and school supplies, as well as regular checkups and treatment at local health care centers. The social workers support families like Najla’s until they can provide for themselves. UNICEF and partners are working tirelessly in Syria, Yemen, South Sudan, Bangladesh and around the world to save and protect children. With a presence in more than 190 countries and territories, UNICEF has helped save more children's lives than any other humanitarian organization in the world.